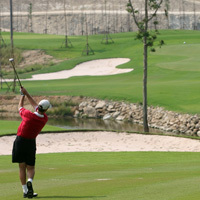 The golf course looks as natural as possible and maintains many of the original features of the site. The most important of these are the natural creeks that run throughout the course and the rocks that have been used as design features on many of the holes. Many of the original trees have been kept and many new trees have been planted to frame the holes. The view from the clubhouse is stunning, and gives a panoramic view of the whole golf course. The clubhouse facilities on offer include fine dining in the restaurant, a well stocked golf shop and luxurious locker rooms.